one foot in each, two foot, in and outs, inky shuffle, bunny hops, ski jumps. Footwork, on toes, knees up, pump arms - relate to game, quickness with and without the ball. P2 Pinnies - head up? Set up a channel 8x20 for semi pressure after, so that receiving to turn on back foot is harder to accomplish. Tight space means that pass may have to go to middle player with pressure on their back. Play begins with player on ball taking a touch out of his feet to one side or another. Middle player checks away and comes back to receive the ball. He has two touches, one to control and one to find the target player. Player C blocks the pass to D and as the pass is made, pressures B from behind. Player B takes touch inside and finds D.
Player D dribbles back at speed. A becomes defender, B becomes targetman, C becomes attacker, D becomes original passer. P. Player D beats Player C with Ronaldo chop/Maradona on way back. - Good touch out of feet and head up. - Movement of target to create passing lane. 1. 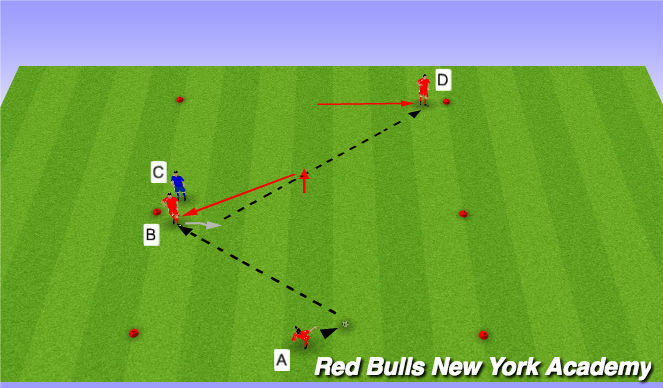 Player B looks to spin their first touch (inside of foot) around the corner and play the pass. Send defender from another channel, count how many points you get. P. Go to goal - alternate which channels go. Each channel takes it in turn to try and find the forwards feet. Midfielder and forward players only ever have two touches. Only midfielder or forward can score. Once the ball goes out, the next group goes. P. Defender can tackle forward as well. P. Second defender in place behind forward. Blue v. White in the middle - their objective is to connect one neutral to the other. 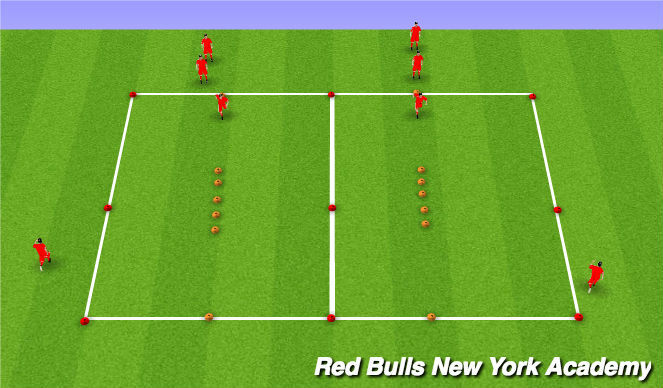 Score 1 pt for each time they get the ball from one red to another. First team to 2 pts wins. Losing team switches with the neutral. 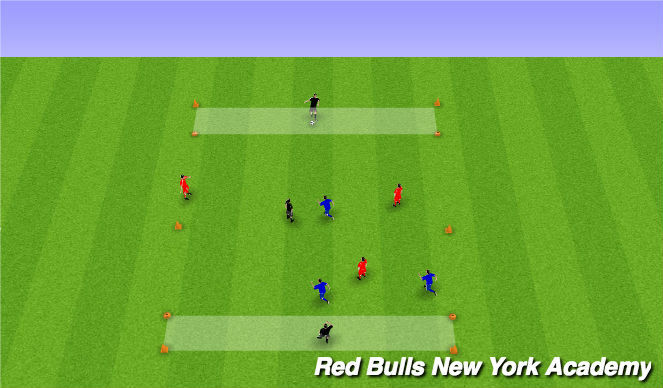 - Movement of middle player to check away - open body. 3 teams playing 4v4. Winners stay on. Play for 2 minutes or 1 goal, whichever comes first.